At St. Mark’s, we approach teaching the habits of character and the skills of leadership with the same intentionality we apply to teaching the academic disciplines. Our Character and Leadership education curriculum is comprehensive, spanning grades 1-12 and guided by defined learning outcomes for Lower, Middle, and Upper School. Our mission is to develop boys into good men and to provide our students with essential concepts, virtues, and skills that will help them thrive and will, in turn, allow them to contribute to the well-being of their communities. 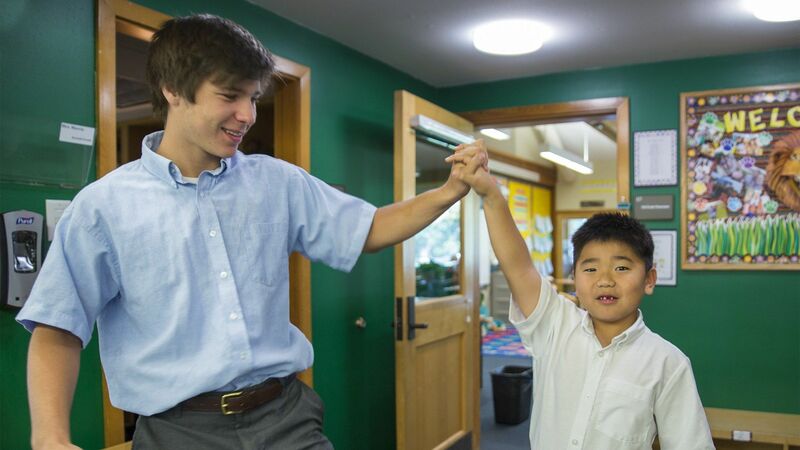 As a starting point of Character and Leadership education at St. Mark’s, the Lower School introduces students to fundamental concepts, habits, and skills that form a solid foundation for each boy’s growth at St. Mark’s. Guided by a shared vocabulary and defined outcomes, Lower School teachers integrate these foundational concepts into daily classroom activities. By the end of 4th grade, our youngest Marksman will be able to articulate, explain, and put into practice essential concepts to help them thrive as boys. Building upon the foundation of Lower School, while helping new students transition to St. Mark’s, the Middle School reviews essential concepts, habits, and skills while also introducing new ideas to nurture the development of each boy’s character and capacity for leadership. Through a series of guided, division-wide conversations, boys reflect on key concepts and record their understandings in the Path to Manhood Portfolio. By the end of 8th grade, students will be able to articulate, explain, and demonstrate their mastery of concepts and skills of caregiving. Continuing to review the essential concepts, virtues, and skills learned in Middle School while also introducing additional ideas, Upper School Character and Leadership education is integrated in both curricular and co-curricular programs. Guided by defined outcomes and shared resources, teachers, coaches, and Advisors blend essential concepts into their work with the boys so that by the end of 12th grade, students will be able to demonstrate mastery of topics and skills that allow them to thrive by caring for others and contributing to their communities.